Reaching for food to unwind at the end of a long day usually backfires. Not only does it rarely help with boosting energy levels, but some people become more stressed once they start to think about the calories they ate. Have you ever reach for a glass of wine after a long day? Or a bag of chips? 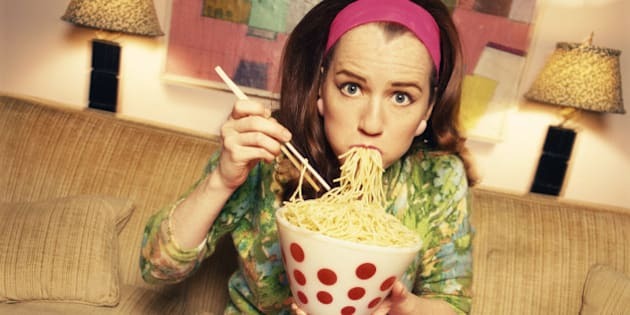 Do you find that you feel just as tired or stressed after eating? Although food can sometimes be a comfort, it rarely decreases stress or fatigue (unless of course you are hungry and lacking calories). This is especially true for people who don't eat intuitively or are chronic dieters. If you are counting calories or are desperately trying to lose weight, any overeating or indulgence usually evokes panic. Feeling like any unplanned eating is a catastrophe tends to make things worse, evoking feelings of "what the heck, I've already ruined my diet, I might as well keep eating." Whereas if you eat intuitively, you are likely to stop eating before getting too full and will naturally compensate at the next meal and are thus more comforted by food. If eating doesn't help you feel better, you've essentially wasted that precious time you could have spent doing something that would actually help you feel better. Next time, before reaching for something to eat or drink, take a moment to think about what you are feeling. If you are not hungry, will food make you feel better? Has this way of relaxing or de-stressing ever worked? Ask yourself "what am I going to get out of eating this?" before eating mindlessly. Before eating for comfort, as yourself "What am I going to get out of eating this?" - tweet this! In fact, a study published in Health Psychology found that so-called comfort foods didn't actually comfort participants any more than other foods did or even more than those who ate no food. In this study, the participants were given a food they found comforting, a food they enjoyed but didn't expect to be comforting and no food at all. They were instructed to rate their mood after watching a video and found that the results were the same across the board: comfort food did not improve mood better than other foods or no food. Moreover, the amount of food eaten did affect mood so there was no correlation between the amount eaten and the comfort received. They also found no correlation between the expected degree of comfort and a change in mood. In other words, even though participants thought some foods would comfort them more, they did not. Although this study was not a very big one, it raises some interesting questions!